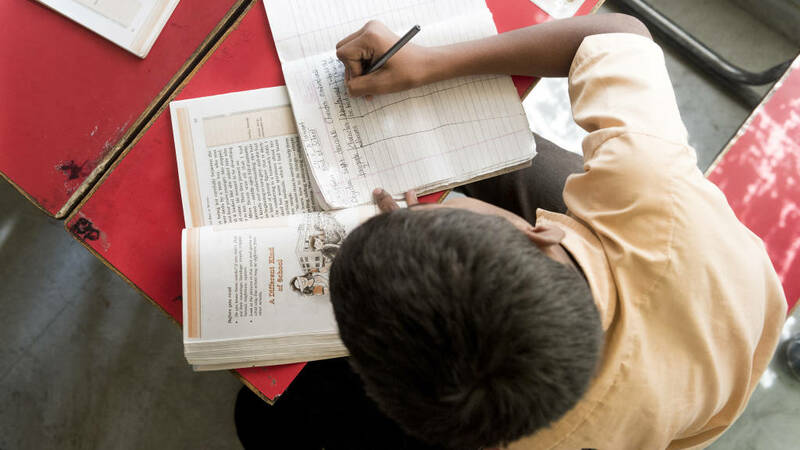 India has been straining for years to reach an ambitious goal of educating all of its children, but is still struggling with low engagement in the classroom and a high dropout rate. 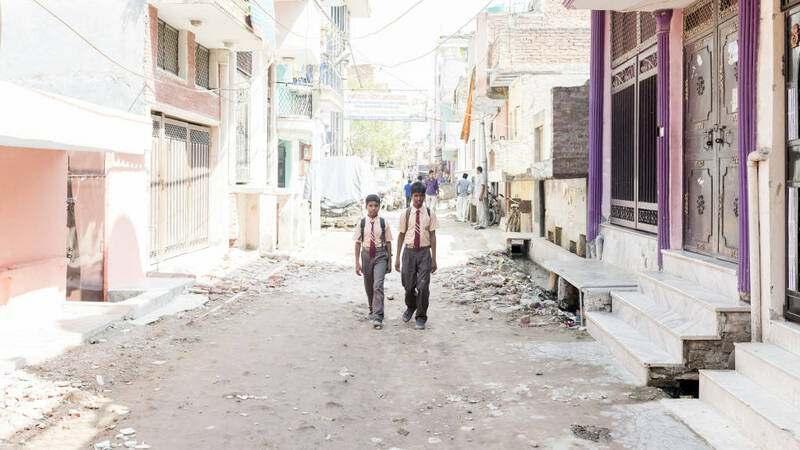 When the Rehmans finish buttoning their salmon-pink uniforms and tying their burgundy ties, they hitch up their backpacks and start the walk to school, passing unfinished brick walls and wires hanging from buildings. Their destination is a noisy classroom. Taped up all over its walls are colorful pieces of paper encouraging “courtesy” and “kindness,” and crowding the floor space are about 35 worn, dirty two-person benches. The students are willing, but the resources are few. India’s goal is to have 500 million people trained for the growing industries of the world by 2022. 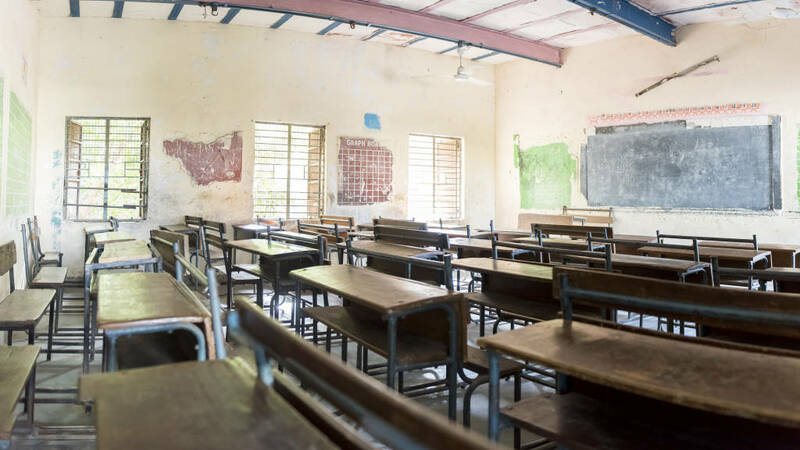 As part of its most recent five-year plan, India aimed to cut dropout rates from 50 percent to 20 percent in primary schools, but failed to meet this goal when the clock ran out two years ago. Percentages and statistics like these seem like unfeeling data until one realizes that it means that nearly 1.4 million 6-to-11-year-olds are not attending school, not learning, not preparing for the jobs that their families and country will need them to do when they grow up. The good news is that the first phase of the daunting task—just getting the children to school—has been remarkably successful, with 96 percent now enrolled, thanks to a push from the government. Infrastructure improvements—the number of schools now tops 1.4 million—have made it possible for almost all children to attend a primary school and upper primary school within walking distance. The new problem is that by graduation day, most of these gains are lost and the children are gone. Ninety percent of Indian children don’t complete their secondary schooling. India’s goal is to have 500 million people trained for the growing industries of the world by 2022. How will it reach that goal given that in 2009 most of its population had only high school educations and only 10 percent of its population was going on to university? It’s not for lack of desire that India is struggling to achieve its goal; the government spends the third largest amount on education after the United States and China. It’s that the task it set for such a large population is so noble, complex and daunting. Teach for India: working to eliminate educational inequality in India. The desire is that the enthusiasm of the Teach for India teachers, or fellows, who take two years out of their careers to teach and who will likely go on to work for multinational corporations, will help keep the students engaged and in school. “Everyone has a right to educa tion, so there is a high enrollment and parents are happy to send their children,” says Shifali Thakkur, manager of development and alumni impact for Teach for India. It’s the teachers’ jobs to keep them there. Today 1,100 fellows work with 320-plus schools to educate 40,000 students in seven cities. And each year, the organization spreads its geographic wings, adding city after city, from Mumbai to Pune to Delhi to Hyderabad to Chennai to Ahmedabad to Bengaluru. To the students, the fellows stress the importance of taking ownership of their learning, their communities and awareness of their responsibilities at the personal, community and national level. To the government teachers, who suffer from absenteeism, they lead by example. 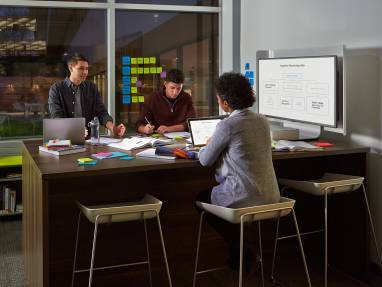 Chalkboards and whiteboards are a classic staple of education. Teachers in India and all over the world use boards as the primary tool for teaching math, writing, literature, history, science and social studies. They also use them to display classroom administration: the date, the schedule for the day, class rules, reminders and upcoming due dates and events. 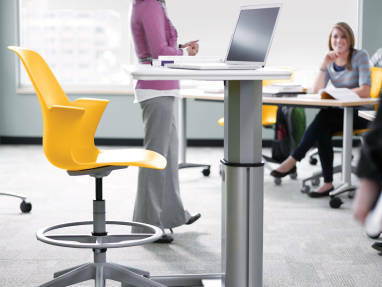 Beyond teacher-to-student conveyance of information, though, large writing surfaces are also critical tools for more active learning, in which teachers invite students to stand up and do math problems with their peers. Teach for India fellows such as those in the Lord Krishna Public School and the Government Girls SR Secondary School employ engaging strategies daily. If Indian schools had boards that were easier to use, children could take a substantial role in their education. A University of Wisconsin study found that quality visual aids can improve learning by up to 200 percent. It’s by engaging the material on an analog tool with their brains as well as their bodies that information is cemented more firmly in the children’s minds. The medium matters. PolyVision’s Lewchanin recognizes the challenges in these schools and says, “It’s always a little humbling to see the spaces that the students work in. After having gone there a number of times, the question you start to ask is, ‘What can I do to help?’” One of the easiest and quickest solutions is replacing the writing surface. of teachers polled think that writing on boards increases learning and nearly all believe that the writing board is an essential teaching tool. So many of the world’s problems seem to need macro solutions, when often it’s the micro solutions, the one-to-one efforts, that work the best. For education, one quality writing surface plus one dedicated teacher seems to be the correct arithmetic for effecting positive change. 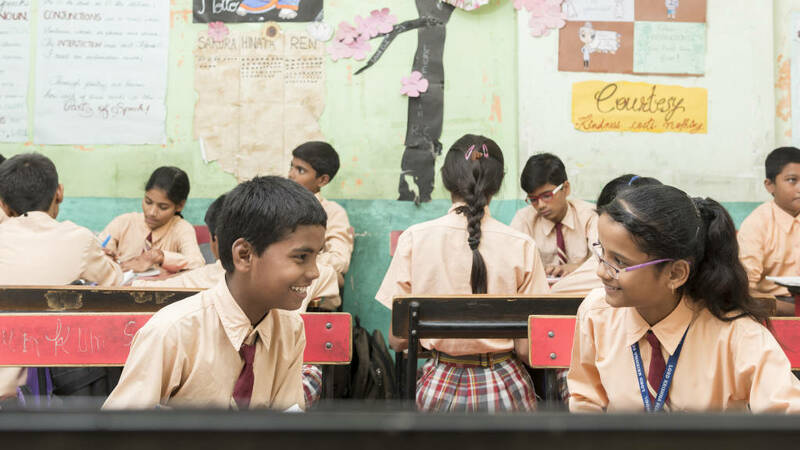 PolyVision, a Steelcase company, decided to donate e3 CeramicSteel whiteboards and chalkboards to schools served by Teach for India, a six-year-old non-profit modeled after Teach for America. Like its counterpart in the United States, Teach for India pairs under-resourced schools with recent university graduates for two years. 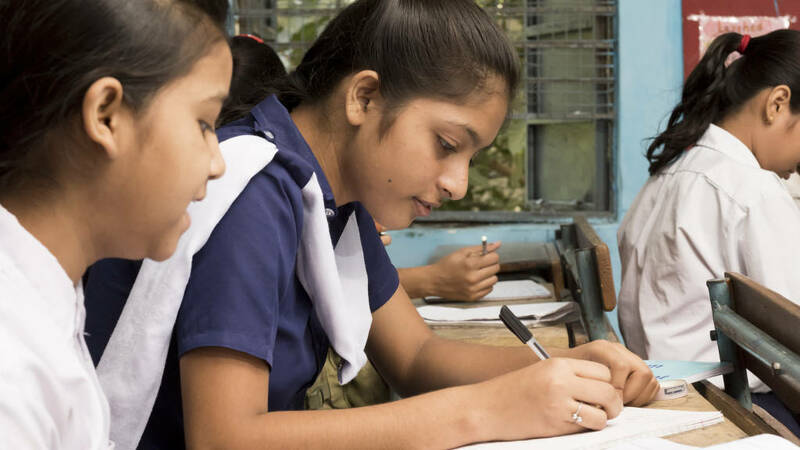 By partnering with local, Indian organizations already deep in the trenches, PolyVision was able to identify schools with real needs and engaged teachers. 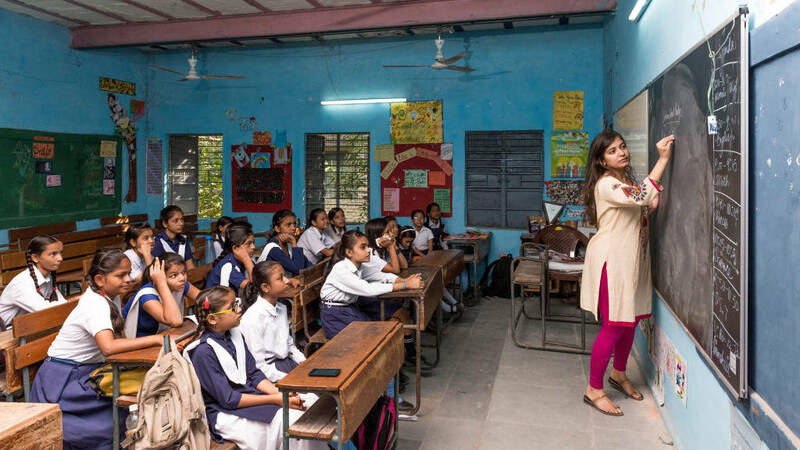 “We see a difference in the students when the teachers are engaged and encouraged to help their students,” Shifali Thakkur, manager of development and alumni impact for Teach for India, says. 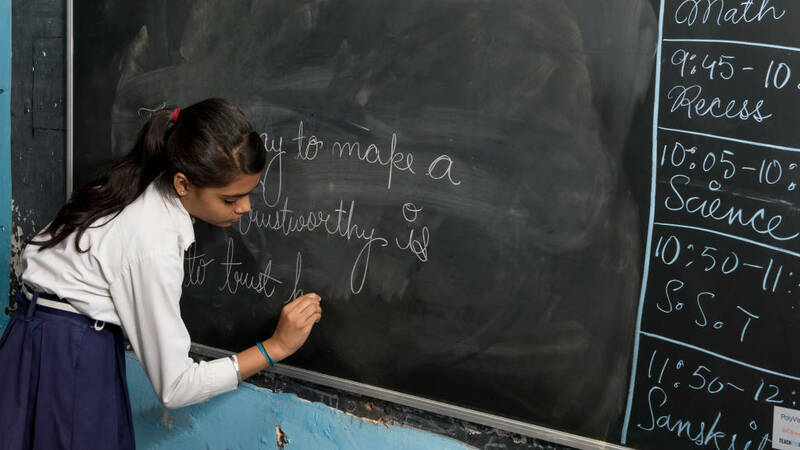 “They help create more structure and even extracurricular activities.” One current Teach for India fellow in a government school for girls is so passionate about poetry that she has her students participate in so-called “poetry slams,” a competition in which students recite their original poetry in front of the class. PolyVision chose to donate hundreds of its e3 CeramicSteel whiteboards and chalk-boards. The boards come with a lifetime warranty, making them long-lasting tools. They are scratch-, marker-, graffiti- and fire-resistant. What gives the boards their steadfastness is the proprietary manufacturing process, which bonds porcelain enamel to metal by fusion at a super-high temperature. The result is the prime choice around the world for demanding and highly active environments ranging from applications for writing surfaces to architectural cladding. PolyVision hopes its investment pays off with a new generation of educated children in India.